In Lviv was held a meeting of an organizing committee that is in charge of preparing Forum of Ukrainian migrants from Central and Western Europe entitled “Ukrainian youth in Europe” and Youth meeting is called for the end of September 2018 in Rome. The meeting was chaired by bishop Josyf Milyan, head of PMD (Pastoral Missionary Department), PMD secretary fr.Andryi Hakh, PMD assistant fr. Roman Ilnytskyi, PMD expert fr. Yustyn Boiko, PMD expert fr. Vitalyi Khrabatyn, head of UGCC Youth Commission, fr. Rostyslav Pendiuk, fr. Roman Demush, heads of youth organizations UYC (Ukrainian Youth for Christ), “Obnova”, “Plast”, UYA (Ukrainian Youth Association). Organizing committee’s participants discussed organizational moments of preparation for the Forum and schedule of events. 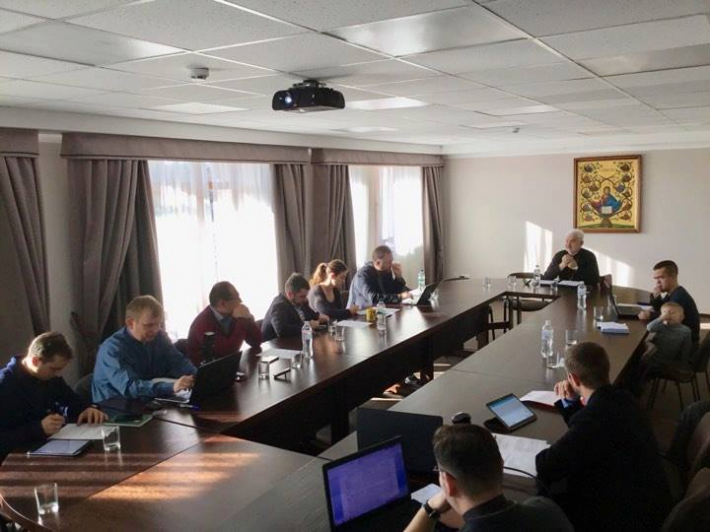 A skype-conference was also held with the representatives of orgcommittee in Rome – fr. Mark Semehen and fr. Yuriy Tykhovlis. Forum of Ukrainians migrants from Central and Western Europe is going to take place in Rome September 27-28, 2018. Forum hosts laity, representatives of migrant associations, youth movements and clergy. The aim of the Forum is to draw attention and discuss the needs and challenges, which Ukrainian youth is facing in Europe. We remind that with the initiative of Department of Pastoral Migration of UGCC, October 21-22, 2016 in Portuguese city Fatima was called the first meeting of Forum of UGCC migrants from Central and Western Europe, during which was decided to hold such kind of event every two years in different countries.